Prime Minister Binyamin Netanyahu will fly to Rome on Sunday to try to fend off pressure from the United States and Europe over his opposition to a French-led effort to forge peace with the Palestinians and to stop the continued building in the Jewish communities in Yehudah and Shomron. Beginning three days of intense diplomacy, Netanyahu will meet U.S. Secretary of State John Kerry and the European Union’s foreign policy chief, Federica Mogherini, in the Italian capital, followed by talks with U.N. Secretary General Ban Ki-moon in Yerushalayim. One of Netanyahu’s immediate concerns is a forthcoming report from the Middle East Quartet, a mediation group made up of the United States, EU, United Nations and Russia, that is expected to use unusually tough language in criticizing Israel’s expansion of the Jewish communities in Yehudah and Shomron. Diplomats confirmed that the current language in the report is strong, on the one hand condemning Israel’s unchecked building of homes in Yehudah and Shomron, which is considered illegal under international law, and on the other, persistent Palestinian incitement against Israel during a recent wave of violence. Netanyahu spoke by phone to Russian President Vladimir Putin this week as part of his efforts to keep the Kremlin closely updated on developments in the region. The leaders have met face to face four times in the past year, with one Israeli official saying the two had developed a good understanding. As well as a desire to defang the Quartet report, there are a series of issues Netanyahu needs to broach with Kerry, including how to conclude drawn-out negotiations with Washington on a new, 10-year defense agreement. There is also the looming issue of a peace conference organized by the French that is supposed to convene in the autumn, although it may no longer take place in Paris. Israeli officials oppose the initiative, seeing it as side-stepping the need for Israel and the Palestinians to sit down and negotiate directly. They argue that it provides the Palestinians a chance to internationalize the conflict, rather than dealing with the nitty-gritty on the ground. Israel President Reuven Rivlin, who addressed the European Parliament on Wednesday, said Israel was feeling impatience with Europe and now was not the right time to push for peace. “Currently, the practical conditions, the political and regional circumstances, which would enable us to reach a permanent agreement between us – the Israelis and the Palestinians – are failing to materialize,” he said. Many diplomats also question whether the French initiative can inject life into an all-but-defunct peace process, which last broke down in 2014, but they are willing to try. A nagging concern for Israel is that the conference will end up reaching a two-state solution with the Palestinians. If that doesn’t emerge from the French plan, it remains possible that a resolution along similar lines could be presented to the United Nations Security Council before the end of the year. 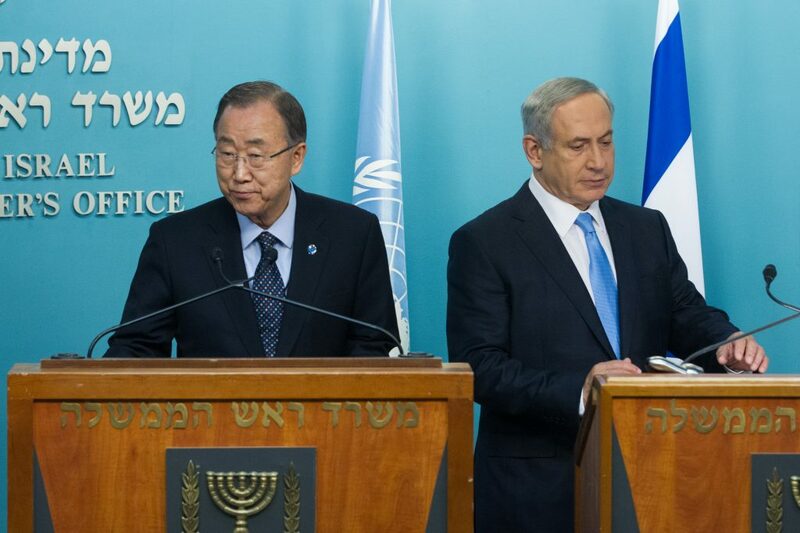 That is another reason why Netanyahu will be eager to sit down with Ban for talks on Tuesday.